Welcome to The Laundry Center, where we can handle all of your laundry needs! We’ve been serving the Rogue Valley area for many years. We know how important your clothing, bedding and other items are to you. That is why we offer full service drop off, fluff and fold service, self service laundry and drop off dry cleaning. 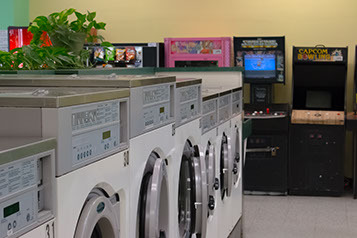 We offer competitive pricing, great customer service, and the nicest, cleanest, biggest laundry facility around. We are staffed from opening to closing, by our friendly attendants. For busy folks, you can take comfort in our drop off fluff and fold service. We know how to treat your laundry and dry cleaning just right. We are locally owned and operated, and provide a safe, modern and clean facility to our customer, that is also air conditioned and has ample parking. We treat each and every item with the same care; whether you are dropping off dry cleaning, bedding or your favorite clothing items.